A film by Mexican director, Alfonso Caurón, that explores the fragility of human inhabitation of space. Gravity begins 600km above the Earth’s surface, where a NASA Explorer shuttle is docked to the Hubble space telescope. Civilian scientist, Dr. Ryan Stone (Sandra Bullock), is retrofitting the telescope as part of a scientific grant, employed we imagine to replace NASA’s dwindling government funding with private investment. 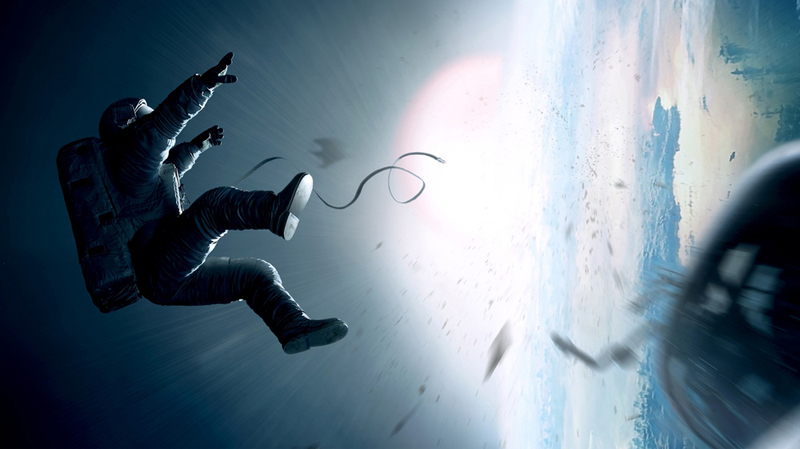 Despite her determination, she is nauseated by the zero gravity, slow moving and clumsy. Floating with contrasting ease on a compressed-air thruster pack is Lieutenant Matt Kowalski (George Clooney), a veteran astronaut whose cheerful countenance masks reassuring capability. This is to be the last spacewalk for Kowalski, who will retire upon returning to Earth. His only disappointment is that his cumulative time in space will be 75 minutes short of the (correctly referenced) world record held by Latvian cosmonaut, Anatoly Solovyev. Easy chatter between Kowalski and Houston is interrupted by a matter-of-fact announcement that a Russian test missile has accidentally struck a nearby satellite. The announcement feels commonplace and unthreatening, a scholarly observation. But it soon evolves into a mission abort order when shrapnel from the collision causes a chain reaction of further satellite impacts, flinging a cloud of high-speed debris towards the Hubble. As the cloud destroys satellite after satellite in its path, communication with Houston is lost. Within minutes, the cloud reaches them and rips telescope, shuttle and astronauts to shreds. The boom to which Stone is tethered is sheared from the shuttle and both are flung away from safety in an uncontrollable spin. Stone manages to untether herself, but is unable to slow her spin and quickly loses all radio contact. The scene, of a tiny white figure alone against the vast backdrop of the Milky Way, personalises the devastation of the collision. For long seconds, the camera focusses only on Stone’s face and the panic written all over it: the tiny gap between life and death in space is made all too clear. When minutes later (though it feels like hours) Kowalski locates and retrieves her, the feeling of relief that floods us is palpable. He is non-plussed, almost casual in his demeanour. Despite the extreme fragility of their circumstances, he calms both Stone and the audience, more reassuring than ever. Illogical as it may seem, we feel certain that both will survive this ordeal. 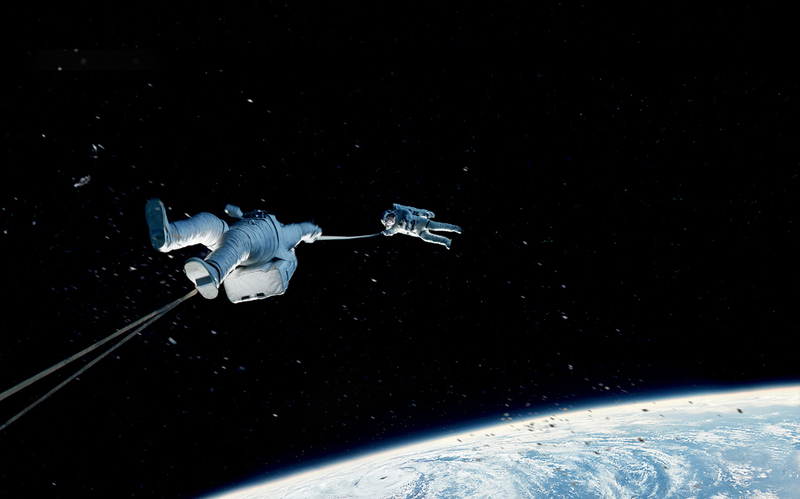 Dear readers, we strongly encourage you to see Gravity for yourselves to discover how the rest of it unfolds. Gravity is extraordinary, the simplicity of its story rendered perfectly by the grandness of its setting: a scientist is retrofitting a sensitive piece of equipment, a soldier is on hand to ensure she can do her work safely. Disaster strikes, and both scientist and soldier must struggle to survive. This trajectory could have easily been set in Afghanistan, out at sea or next to a volcano, but none of these would have matched the power and majesty of space. It is a disaster film, as much about its magnificent use of computer generated imagery as anything else, but it nevertheless manages to convincingly flesh out the personalities of its characters. Caurón treats both Stone and Kowalsky with endearing tenderness: he makes us understand that they are good people, remarkable for having been selected to travel into space, but not superheroes. They are grounded by their own histories and aspirations, backstories that make sense of the actions they take under extreme circumstances. Bullock is excellent. Her long conversations with American astronaut, Cady Coleman, have resulted in a character that is both physically and emotionally convincing: the way she gulps in air to calm her early nausea; her helplessness after she untethers from the shuttle; her swimming movement through the International Space Station. How she managed, in normal gravity, to film the motion of her limbs so they portray a person in zero gravity is beyond us. But most arresting is the film’s unerring faith to the limits of reality. Caurón chose not to invent new spacecraft with which to tell his story, “why invent when we have the most amazing technology already up there?” He has anchored it instead in scientific fact: the shuttle, telescope and space station feel familiar and contemporary. The bulky suits, modern materials and micro-gravity of space travel are as close to the real deal as he could possibly make it. Sound is critical in conveying this quality: the disembodied voices of fellow astronauts, pilots and ground base; the intimate sound of Stone’s breathing, and the way it changes when she is scared, exerting herself or low on oxygen; the low-tech crackle of radio chatter and the strange vibrations of tortured metal; and throughout it all, the uncanny silence that accompanies even the most horrific of explosions. There is only one scene that strays from the strictures of reality, a scene that David Stratton argues “should never have been included.” We’re in two minds: on the one hand, it is the weak link in a film otherwise firmly anchored in, and made plausible by, the physicality of modern space flight; on the other, it is an understandable segue into the inevitable psychological distress that the preceding catastrophes would establish. Either way, by providing a framework for the bulk of Gravity of such convincing realness, Caurón has crafted an environment in which the most extraordinary of events are unimpeachable. We watched the film in 3D at the IMAX cinema in Melbourne Museum, easily worth the extra $6 ticket price. If there were ever a film to convince us of the benefits of 3D cinema photography, this is it: its spectacular imagery of both orbit and collision are breathtaking. Where the perception of depth is constrained in other films by horizons and buildings, here there is only hundreds of kilometres of empty space. 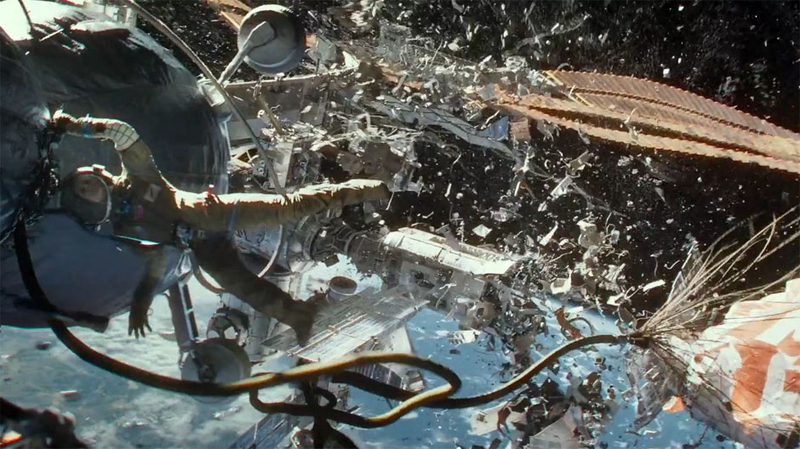 Gravity is a tense film, not for the faint-hearted, and unexpectedly difficult for a parent to watch. But it is mesmerising throughout. 4.5 stars.